I'm still on my kick of learning new stuff. As I said before, I didn't do much design work for about three years and I spent the better half of my first year of freelancing just trying to get comfortable with the Adobe applications again. With my confidence back up, my brain has time to design again. I've found my mind wandering on to bigger and better designs while I'm still layout out my first idea. I know that was supposed to be happening all along, for all the clients I've had, but it just wasn't. I was too focused on the how-to to let my mind create. 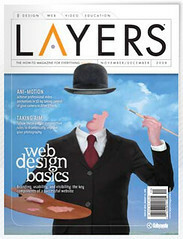 Now in my spare time I've been watching tutorials online and I also subscribed to Layers Magazine. Layers touts itself as "the how-to magazine for all things Adobe." It has tons of articles and tutorials about every Adobe product. InDesign, Illustrator, Acrobat, DreamWeaver, it's all in there. Their website also has a bunch of video that combine two or three applications in one lesson. 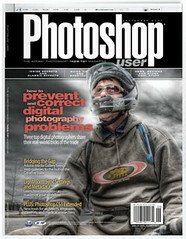 I also picked up a couple issues of Photoshop User. It teaches me to love this big beast of an app again. Do you have any resources you like? Share with me.